Locust Park includes three acres of turf and trees. It’s located below C.J. Strike Dam and across the road from Scout Park. 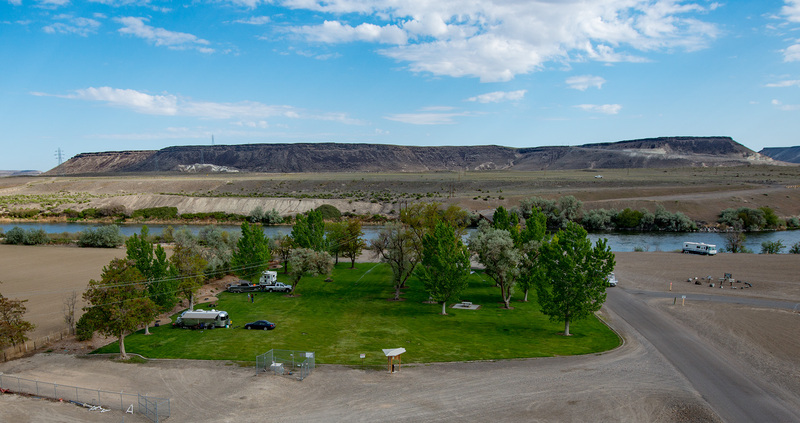 We allow camping using tents or RVs in developed campgrounds or undeveloped areas near the reservoir. Stays are limited to 14 consecutive days. Fees are collected at this park. See our Camping Policies. Obey posted campground rules and keep all motorized vehicles within the posted speed limit. Please note: There is no potable water, electric hookups or reservations. Day use in all parks remains free, however, a fee program is now in place for overnight camping. Fees are consistent with fees charged at other campgrounds with similar services in the area. Fees are posted and collected at each park. Idaho Power offers reduced camping fees to service-disabled veterans and campers over age 60. For veterans with any level of service-related disability, overnight camping fees are lowered by 50 percent. Seniors receive $2 off summer rates and $1 off winter rates. Tent campers camping in a designated RV space will be charged the normal nightly fee for an RV space as listed at each park. A maximum of three tents may be set up in an RV space at one time, if there’s room.